Newfoundland, Canada – June 10, 2013 – If anyone knows how to throw a good party, it’s a hotel. After all, hosting weddings, conferences and special events is de rigueur for hotel staff, which is why a property’s own grand opening is one event no one should miss. The Fairfield Inn & Suites St. John’s Newfoundland will celebrate its grand opening on June 11, and it’s pulling out all the stops for the big day. First on the Fairfield Inn & Suites’ agenda is a silver birch tree-planting ceremony, a tribute both to the hotel’s parent company, SilverBirch Hotels & Resorts, and to the stunning natural surroundings. Close to sights like St. John’s Signal Hill and the port from which iceberg tours depart, these accommodations in Newfoundland live in harmony with the breathtaking environment. Following that, from 3 to 7 p.m., the hotel will host the dedication of the O’Regan Ballroom. This is the hotel’s largest meeting room where two sections combine for a total of 1,152 square feet of space. The room is named after the Newfoundland native and journalist Seamus O’Regan. O’Regan has been a fixture on CTV for more than a decade, first as a co-chair of “Canada AM” and now as a correspondent for CTV National News. Accordingly, O’Regan himself will be in attendance. 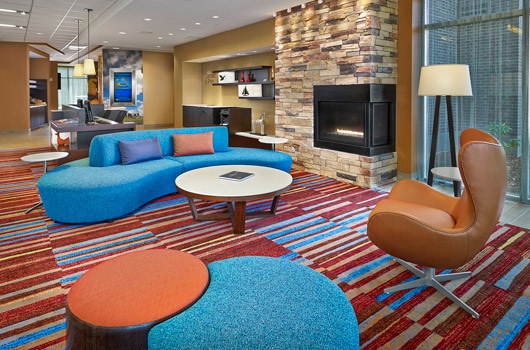 The Fairfield Inn & Suites St. John’s Newfoundland opened May 7, 2013, and has established itself as both a family hotel and one that can just as easily accommodate business travellers. It’s near St. John’s International Airport and sits between it and the downtown area – a perfect location for the frequent business goer. It offers 104 rooms, 44 suites and five meeting rooms, all with close proximity to business parks and leisurely pursuits like golf and biking. All this adds up to plenty of reasons to join the party on June 11th. Located between St. John’s International Airport and the downtown area, the Fairfield Inn & Suites St. John’s Newfoundland is positioned to accommodate business travellers, family of students at nearby Memorial University and those simply on holiday. Business parks, historical sites like Signal Hill and outdoor activities like biking, touring icebergs and whale watching are all equally close at hand. Whatever the reason for visiting, the Fairfield Inn & Suites St. John’s Newfoundland makes it a priority to meet guests’ every need, from the complimentary breakfasts each morning to complimentary high-speed Internet and Wi-Fi in guestrooms, public spaces and meeting rooms. Each of the 104 guestrooms and 44 suites are also equipped with 42-inch LCD flat-panel HDTVs, microwaves and mini-refrigerators for the ultimate in convenience. The five technologically advanced meeting rooms (2,164 square feet), meanwhile, promise inspiration without distractions. Complimentary onsite parking, as well as a fitness center with an indoor pool and waterslide, round out the amenities of this contemporary hotel where value and style define every experience.